I grew up in the small town of Beachwood, New Jersey, where my parents still live. One of the landmarks of that small town was�Beachwood Bakery (later called Baldanza’s and now closed). 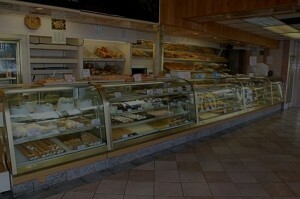 Located just 1/2 mile from our house on Cable Avenue, the bakery was part of our lives growing up. On Sundays my dad would stop at the bakery on his way home from church for bagels or rolls, and tea biscuits or crumb cakes for our Sunday brunch, which he prepared while we were in Sunday School. When my brother and I were old enough, we were given permission to ride our bikes down to the bakery to buy a loaf of bread for dinner, and if I remember correctly my first solo trip the day I received my driver’s license, was to the bakery to buy a loaf of bread. The bread from Beachwood Bakery is the best I’ve ever had. Mostly we just got a large loaf of Italian bread, sometimes seeded and sometimes unseeded. But there was also French, round, and, my favorite, the braided or twist bread. We never cut the braided bread but broke it off a braid at a time. The bread was always soft and warm on the inside and crunchy and crusty on the outside. Perfect. Part of the experience though, was just going there. 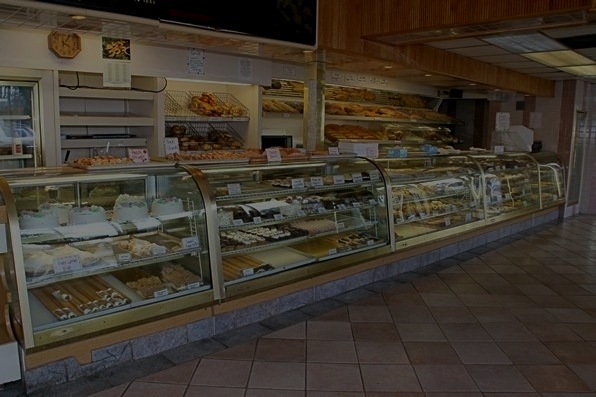 The smells, cake display, the oversized cookies (sometimes they would just give you one), the bell on the door, and even taking a number on a Sunday, are all vivid memories. Those memories often come racing back when I go into King Soopers after 4:00, and the fresh-baked bread is at the front of the store. That’s about as close as it gets to Beachwood Bakery for me. 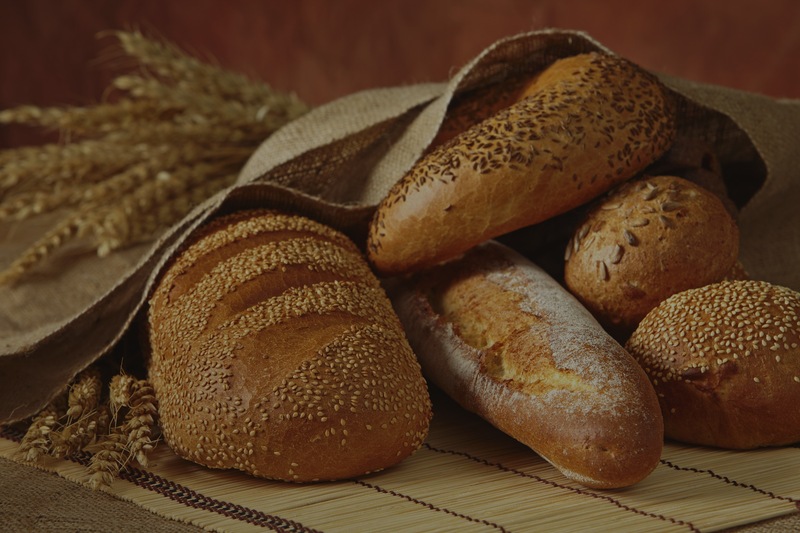 This morning, I am continuing our series on the Lord’s Prayer, by looking at the next phrase Jesus taught his disciples to pray, “Give us this day our daily bread.”� When I pray those words images of Beachwood Bakery come to mind. Maybe for you it is the warm rolls and cinnamon butter at Texas Roadhouse they just give away, or the exotic loaves at Panera, or every once in a while you treat yourself with a trip to Great Harvest Bread Company. Am I making you hungry yet? Or maybe its our communion bread. I don’t know if many are aware of this, but often on Sunday afternoons, you will find one of our youth carrying around some leftover communion bread. When they found out we don’t throw it away, some began to ask if they could have some. We are more than happy to give it away. I don’t know if you can tell it from the small piece you dip in grape juice every Sunday, but it is delicious bread from Safeway. Or maybe for you, a different image comes to mind. Since 1956 there has been a popular publication of daily devotionals called Our Daily Bread. While I like that image, of us treating our discipleship practices as necessary as eating, I don’t believe this is what Jesus had in mind. I think Jesus was talking about literal bread. Remember the disciples, to whom Jesus is teaching this prayer, and the 5,000 who came out from the city to the hillside to be in his presence the day we read about in today’s Gospel lesson, were not wealthy people. They had been�eking out a living before following Jesus as�farmers, fishermen, craftsmen, tradesmen. Finding the bread they would need to subsist on was a daily struggle. There was fear of taxation, the Roman soldiers, droughts, nights when no fish were caught, and other circumstances threatening their way of life. 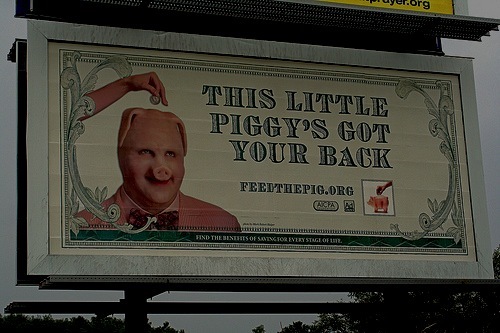 Many lived on the edge of poverty, paycheck to paycheck as we might call it today, and even day to day. For Jesus’ first hearers, immersed in the Old Testament, I think a different image would have come to mind when Jesus prayed, “Give us this day our daily bread.”� They were an oppressed people living in an occupied nation. They felt they were repeating a dark period in their history. Hundreds of years before they had been taken into exile in Babylon. When they were eventually allowed to return home to Jerusalem, things weren’t the same. The Temple, the symbol of the presence of God with them, had been destroyed and the one they had now had been rebuilt by the Romans, their occupiers. In some ways it felt as though the exile had never really ended, even though they were living in their homeland. Many began to long for another period of their history to be repeated. Thousands of years before, the Israelites had moved to Egypt because of a famine in their land. One of their own, Joseph, had risen to prominence in Egypt by predicting the coming famine and using his managerial skill to prepare the people for it. He had done his job so well, Egypt was able to feed Israel through the lean times. Genesis ends with the people of Israel living happily in Egypt. Then, in the opening verses of Exodus, we read these ominous words, “Now a new king arose over Egypt, who did not know Joseph”� (Exodus 1:8). This king enslaves the people until a man of God named Moses comes to free them. He miraculously leads them to the land God promised them, Israel, where they built the Temple, the sign of God’s presence among them. In Jesus’ day, this people, feeling like they were in exile in their own land, were looking for a new Moses to be sent by God to free them and lead them back into the presence of God. The journey from Egypt to Jerusalem led them through a desert called Sin. There was nothing to eat and nothing to drink, other than what God provided for the people. In our Old Testament lesson for this morning, we read about the food God provided for the people. Later in the passage we read the Hebrew people called this substance manna (presumably from the Hebrew word man which means “What?”� from “What is it?” in verse 15). Notice the manna has a 24-hour expiration date. They are to collect it in the morning and use it all day, but if they try to save it overnight, it goes bad – there’s a foul smell and worms. 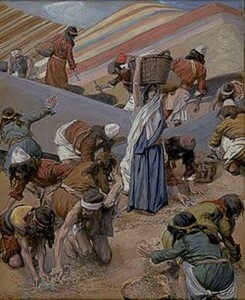 The manna was quite literally daily bread. Everyone got what they needed. No one was short and no one had too much. It was enough, enough for today with nothing left for tomorrow. The Israelites had to trust God to provide more tomorrow, which is the point of why God tells Moses in providing the manna God is testing Israel, “whether they will follow my instruction or not”� (Exodus 16:4). As Jesus teaches us to pray, “Give us this day our daily bread,”� he is calling us to make a statement of trust. He doesn’t teach the disciples to pray for a lifetime of bread. He doesn’t have them praying for enough to put some into their pension account every week. He doesn’t even have them pray for enough for the year, or the month, or a week. It’s just today. Give us this day our daily bread. Remember the still-to-be-preached sermon series we’ve talked about called, Things We Wish Jesus Hadn’t Said? I’d like to add this one to the list. I want to know I’m going to be OK, not just today, but tomorrow too. I’d like to know I’ll have a job next week, next month, next year. I’d like to have enough in my savings account to get me through a dry spell. Oh, and I’d like to have a little bread left over to have some fun, too. That doesn’t exactly sync up with “Give us this day our daily bread,”� does it? I like to think I rely on God, and believe I have faith in him. But in many ways, I don’t. Next year at this time my oldest, will be starting college. I’d like to know NOW how we are going to afford that. I am approaching retirement – I guess we all are unless we’re on the other side of it – and I would like to know NOW how much money I can count on every week. To be honest, I’d really like to hit the Powerball and have millions of dollars put away somewhere knowing I could just live off the interest. And I don’t think I’m alone. Many of us who say we trust God to provide for our needs are up in the middle of the night worrying about bills, wondering if the furnace is going to make another winter, or worrying that noise in the car might mean a major repair is not far away. We worry about paying for care for mom and dad when the time comes, or if one of us gets ill and needs major care. We want more than daily bread, we would like to know there is this stockpile of bread out there somewhere to help us get through. Every dollar bill has printed on it, “In God We Trust,” but I would argue many of us trust that dollar, and our own ability to earn and manage them, quite a bit more than we trust God to do the same. We need to rethink our relationships with our money and stuff. 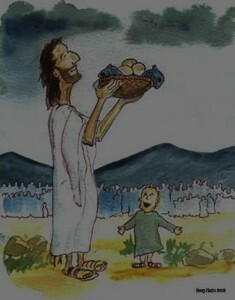 Our daily bread, is about the realization we are wandering in the wilderness and need God to provide for us every day. It is recognizing that what we have, even what we have earned, is a gift from God. Jesus calls us to trust God to provide for us – what we need for today, then tomorrow what we will need for tomorrow, then the next day for the next day. Give us this day our daily bread is a statement calling us to trust God for today, but it is also a statement about tomorrow. One of the things that strikes me when reading the first four books of the New Testament is how often we read about Jesus eating. We read stories of him eating with his disciples, going to the home of Mary and Martha who prepare a meal for him, and inviting himself to Zacchaeus’ house to eat. As we read this morning, Jesus took the time to turn five loaves and two fish into a meal for 5,000. There are stories about Sabbath meals with Pharisees and Sadducees, a meal interrupted by a woman who anoints him, a wedding banquet where they run out of wine. Then there is, of course, the story of the meal we will remember together later in the service as we “gather around the table”� to receive the bread and juice of holy communion. Then even after his resurrection, when Jesus appears to his disciples, we are told about Jesus eating – even barbecuing fish on the beach! Meal after meal after meal. There were so many meals, we also read about him responding to the accusation that he is a glutton and a drunkard. Then there are all the stories he told about parties: wedding banquets, celebrations at the return of a son, a rich person throwing a feast his guests ignore, all of which include food. Jesus must have been around food a good deal. No other account of an historical figure, unless they were a chef, includes so many mentions of a�mundane detail like�meals. Yet the Gospel writers include these stories as much as any other type of story – teachings, miracles, and healings. These meals, this food, were not just routine�for Jesus. They were central to his message. Jesus was doing something with these meals. He was making a point, a statement about the Kingdom of God. Jesus’ ministry was consumed with announcing the day of the Lord had come in him. God was not far from his people, as they assumed. He had not abandoned them in exile in Egypt, Babylon, or here in Jerusalem under Roman occupation. He was here, in him, and was coming in fullness soon. Jesus’ meals were a pronouncement of the provision of God – yesterday, today, and in the day still to come. God is coming, Isaiah says, and he is bringing food! We will feast with God. There will be no death, no crying, and plenty to eat for everyone. Through his stories and meals, Jesus announced that day of which Isaiah had prophesied had come. He was proclaiming that in him the Kingdom of God had come in a new, fuller way. So when Jesus prays, “Give us this day our daily bread,” he is in essence saying, “Let the feast begin,”� or as NT Wright says, “Let the party continue”� (Wright 40). God is here, let’s celebrate with everyone! Our job as a church and as individual Christians, as the body of Christ in the Tri-Lakes region today, is to continue inviting people to the party. I cannot begin to express how thrilled I am at the way Tri-Lakes United Methodist Church has kicked off our fall. 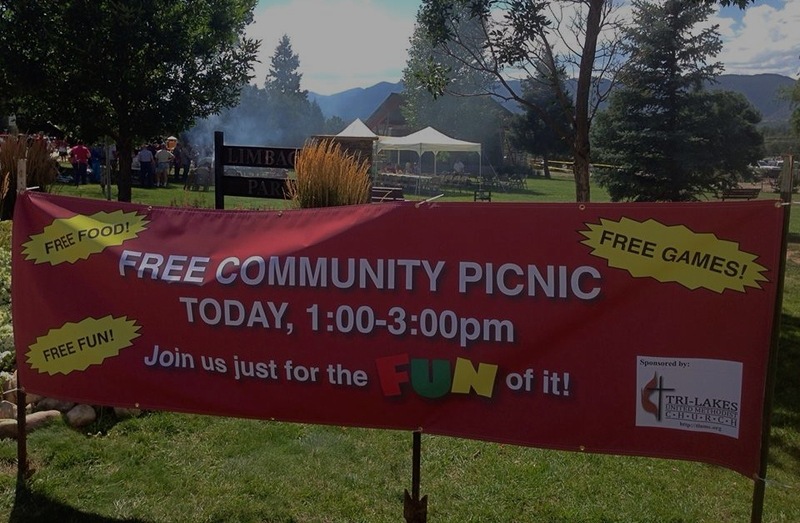 The Free Community Picnic was amazing. We had a lot of fun and gave away some food. The cynic might say it didn’t make a dent in the hunger problem in our area. 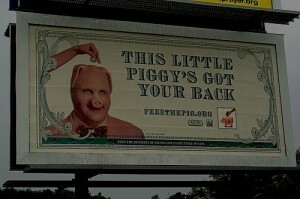 We’re not even sure the most needy people in the area even knew about it. And probably no one will start coming to our church because we were in Limbach Park last Sunday. So what was the point? Like Jesus sitting down with 5,000 people on a hillside for some bread and fish, it was a pronouncement of what we believe. God is here. Let the feast continue. 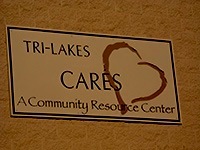 We are collecting food for Tri-Lakes Cares. We have this outrageous goal of 5,000 pounds – taken of course from our Gospel lesson for this morning. Jesus provided food for 5,000. We want to provide 5,000 pounds of food. Why do we do this? It is a pronouncement. God is here. Let the feast continue. Today we are collecting flood buckets for our neighbors deeply affected by the rising waters. It is difficult to wrap our minds around what is happening to our neighbors. We do what we can. Why? Because when there is a need, Christ responds. 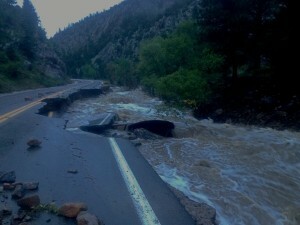 God is providing – food for the hungry, and flood buckets for those in need. God is here. Let the feast continue. 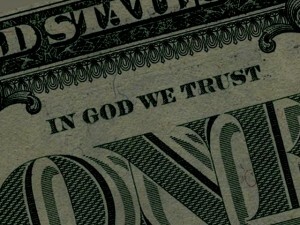 Have you noticed that all the pronouns in the Lord’s Prayer are plural. We don’t pray, “Give me this day my daily bread,”� but “Give us this day our daily bread.”�I think that is far more than just because Jesus is teaching this prayer to 12 guys, and whoever else in within earshot. Instead I believe Jesus is teaching us to pray far less selfish prayers. We pray not only for ourselves, but for our neighbors and friends. We pray for those we do not know who do not have enough. We pray not just to get ours, but for God’s Kingdom to come on earth as it is in heaven. Sometimes, we need to pray bigger prayers. the Eucharist is the place where, precisely as the people of Christ, we have the responsibility to come on behalf of those in desperate need, not least hunger. Jesus celebrated the Kingdom by sharing feasts with all sorts of people. So should we. Here’s a practical suggestion…�The next time you come to the Eucharist, bring with you, in mind and heart, someone you know, or know of, or have seen on television, who desperately needs God’s bread, literally or metaphorically, today. Bring them with you; let them kneel, in your mind’s eye, with you at the altar rail; and let them share the bread and wine with you. And, as you return, strengthened by God’s food, ask yourself what this new friend would mean when she or he prays, “Give me this day my daily bread.” Then ask how you might be part of God’s answer to that prayer. After all, we ourselves are only at Jesus’ table because he made a habit of celebrating parties with all the wrong people. Isn’t it about time we started to copy him? (Wright 48). May we not just pray the prayer. May we work for what we pray for, and may we celebrate. God is here. Let the feast continue. Wright, N. T. The Lord and His Prayer. Grand Rapids, MI: W.B. Eerdmans, 1997. Print.